Our excellent tutors are not only skilled in early-childhood education, but also passionate about it, too. 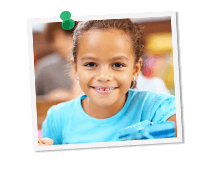 Through personalized, in-home help from a friendly kindergarten tutor, you can give your child the foundation for a lifetime of better learning and self-confidence. Our kindergarten tutors cater to each individual child they work with—so you can count on their taking your kindergartener’s specific personality and learning style into account. From the first time you call our office, we seek to understand your child’s needs so we can help him or her work towards specific academic goals. At Grade Potential, we believe young minds need the right kind of support. That’s why, unless specifically requested otherwise, we use credentialed teachers with our elementary school students. As with all of our tutors, we take great care to ensure that your kindergarten tutor is the right match for your child, both in terms of personality and rapport.